The role of a journalist has undergone a transformation from what it was considered twenty years ago. 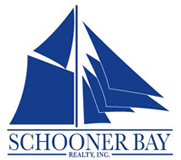 No longer do television anchors only report the news on their respective live broadcasts, but each type of journalist has the added responsibility of making information available instantly. We also do not have to get up on cold mornings to run outside to get the newspaper to find out what is going on in the world when we have all of that information published and shared in almost real-time for us on the internet. One particular area that I wanted to focus on is sports. In the past, if you wanted to see a game but had prior commitments, you would more than likely have to catch up with your friends in school the next morning and get all of the highlights. Now, getting game scores and video highlights comes in the form of several different sports applications for smartphones. You have a men’s softball tourney and can’t watch the game? That’s cool. MLB At Bat (or insert your favorite sports app here) has you covered. Or, you can check out your favorite social network and see posts from the sports teams themselves showing the box scores from the evening–sometimes even with video highlights. I’m going to use my favorite team as an example. This season more than any other that I can recall has seen the Tampa Bay Rays plagued with injuries–mostly to the starting pitching staff. This past week Jake Odorizzi came out of a game in the fifth inning against the Seattle Mariners. 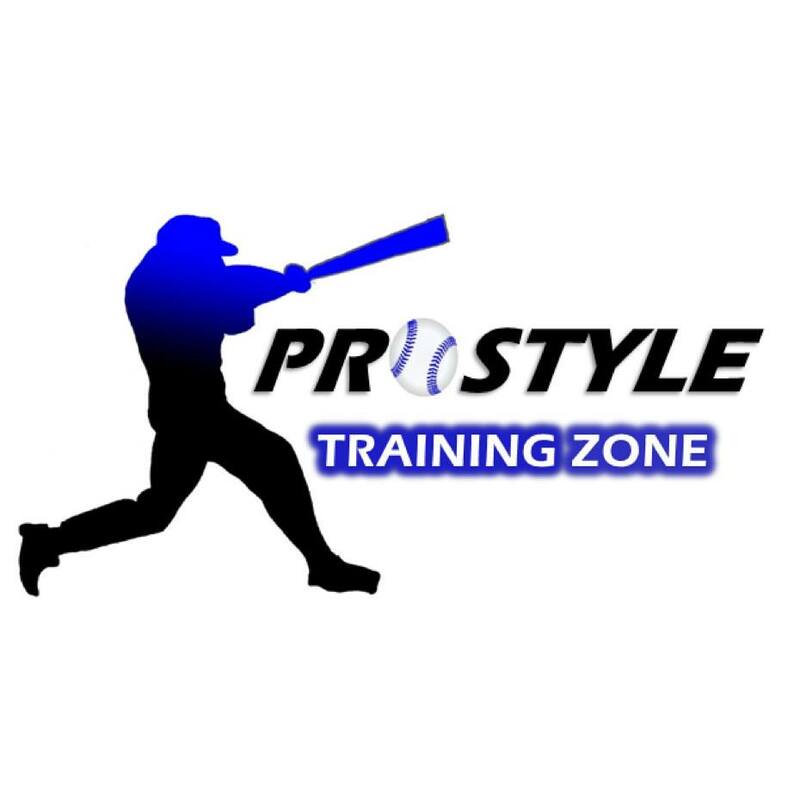 Since the team was playing in Pacific Standard Time, those dreaded days of the past would have made you wait until the next morning to find out what was wrong with Odorizzi either with an update in the paper or you would need to cross your fingers that during the sports segment they would let you know a status update. Now once the player goes down the tunnel and is evaluated, updates are posted to social media. Don’t get me wrong, it was always really exciting to talk to friends the next day in school about a game that I did not get to see, but I much rather prefer being able to find out what happened on my own time with blow-by-blow updates. Also, in some cases, if you subscribe to different plans–MLB has one for example–you are able to stream games from your mobile devices. You really do not even have to miss any grand slams or epic wins again. BUT, if you must miss a game or you are like me and find yourself interested in all of the “behind-the-scenes” details, following someone close to the action is ideal. 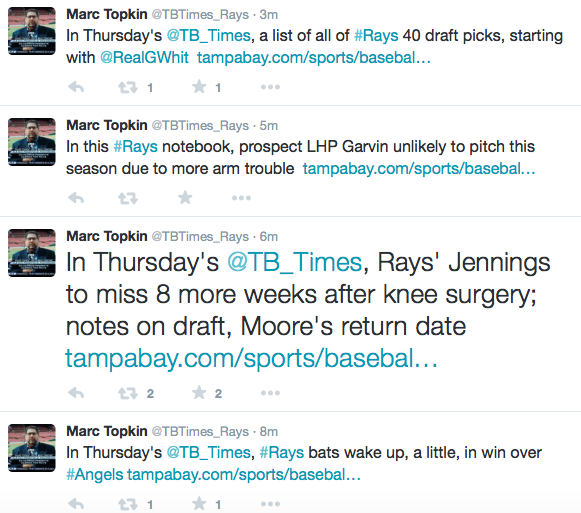 The Tampa Bay Rays beat writer that covers the team for the Tampa Bay Times is Marc Topkin. As we can see in his tweets below, we were alerted (if we were not watching the game) that Odorizzi came out, and then we were updated with what the team said. The news was tweeted as it came our rather than Topkin sitting on it and waiting to share it until the next morning. This is an essential aspect to how social media has changed the way we receive our news because we are requesting it now. So, we get as much information as journalists have available as soon as they have it available to fulfill our needs of immediacy. As a fan, and having grown up in the digital age, I expect the news to be delivered quickly. 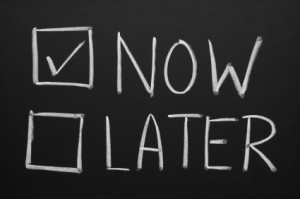 In my opinion, I feel that when we have to sit and wait on the news that it is time to find someone else who will deliver it at a faster rate. Another example is the team transactions. Topkin provides updates on when the team sends players to the Disabled List (“DL”) and recalls others. You can see in the next example how Topkin has even provided links to his news pieces in the form of blogs prior to the actual print edition in the following morning’s newspaper. Typically these stories are a more complete version of what has already been tweeted out as updates. 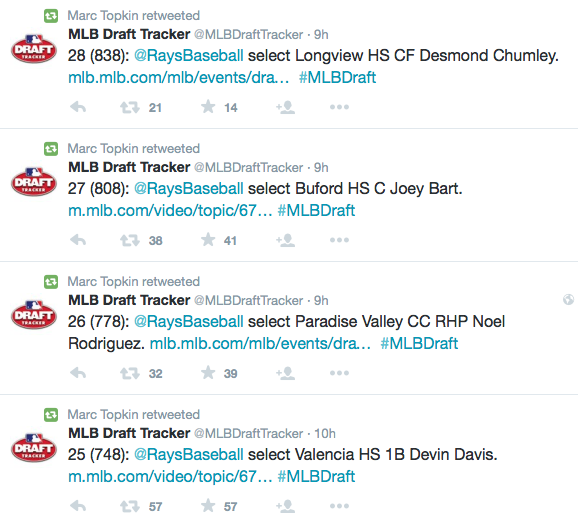 During the MLB Draft this past week, Topkin retweeted all of the Rays’ draft pick information so that fans were aware of our new players. I found this to be helpful because as amazing as technology is, during bad rain storms our satellite dish goes out so we are left without television until the storm is over. 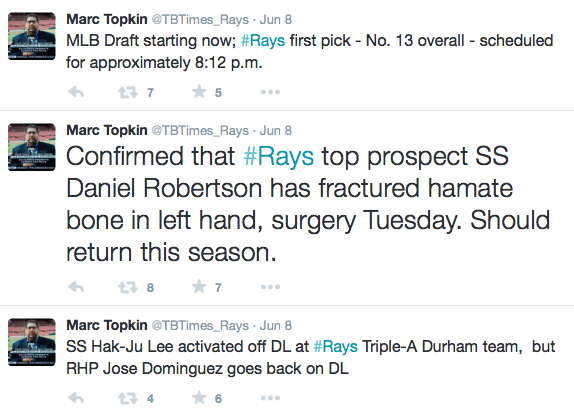 During this time, I was able to keep up with the Rays rumblings. What Marc Topkin is doing is enhancing his journalism with the use of social media. Topkin is able to respond to fan questions, provide up to the minute updates regarding the team, and even post the links to his stories once they have been published and ready for print. It may seem silly to a non-fan, but to me (and my fantasy baseball team), it is essential to know which players are in the starting lineup each game well in advance of the actual game and if they are not, then why they are not. 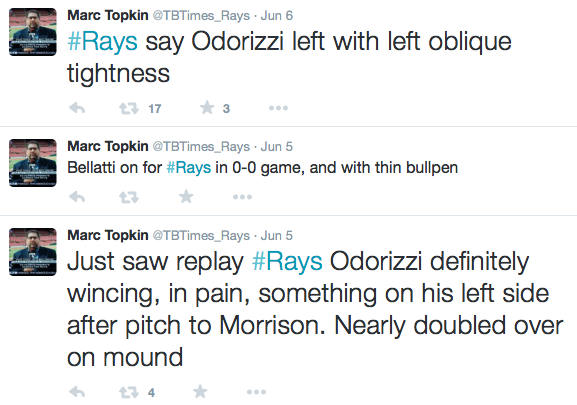 I am sure that since Marc Topkin has covered the Rays for numerous years, that he has needed to learn how to use Twitter in order to keep what he does relevant to fans so they do not seek information in other places. It has also given him the opportunity to speak to the fans, because I am not sure that in the past he would have been as accessible to the Tampa Bay faithful. I sent Marc a request to see if he would allow me to ask him some questions about how social media has transformed his role as the team’s beat writer over the years, but unfortunately he did not respond. One thing that I think would enhance Topkin’s social media would be to add short videos since users tend to engage more with media-rich posts. If you find yourself demanding constant coverage for your favorite team or sport, who do you follow for the best updates and why do you enjoy following that person?